A chronicle of life on the resplendent island. 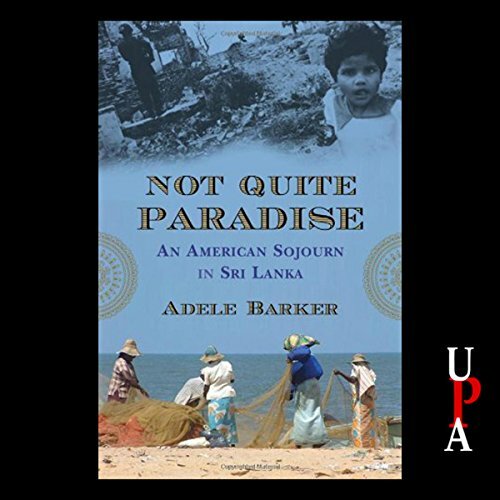 Adele Barker and her son, Noah, settled into the central highlands of Sri Lanka for an 18-month sojourn, immersing themselves in the customs, cultures, and landscapes of the island: its elephants, birds, and monkeys; its hot curries and sweet mangoes; the cacophony of its markets; the resonant evening chants from its temples. They hear stories of the island's colorful past and its 25-year civil war between the Sinhalese majority and the Tamil Tigers. When, having returned home to Tucson, Barker awakes on December 26, 2004, to see televised images of the island's southern shore disappearing into the ocean, she decides she must go back. Traveling from the southernmost coasts to the farthest outposts of the Tamil north, she witnesses the ravages of the tsunami that killed 48,000 Sri Lankans in the space of 20 minutes, and reports from the ground on the triumphs and failures of relief efforts. Combining the immediacy of memoir and the vividness of travelogue with the insight of the best reportage, Not Quite Paradise chronicles life in a place few have ever visited. The book is published by Beacon Press. If you have any questions about this product by University Press Audiobooks, contact us by completing and submitting the form below. If you are looking for a specif part number, please include it with your message.